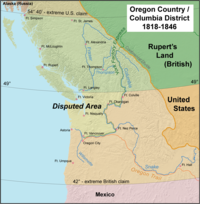 The Oregon Treaty is a treaty between the United Kingdom and the United States that was signed on June 15, 1846, in Washington, D.C. Signed under the presidency of James K. Polk, the treaty brought an end to the Oregon boundary dispute by settling competing American and British claims to the Oregon Country; the area had been jointly occupied by both Britain and the U.S. since the Treaty of 1818. The Treaty of 1818 set the boundary between the United States and British North America along the 49th parallel of north latitude from Minnesota to the "Stony Mountains" (now known as the Rocky Mountains). 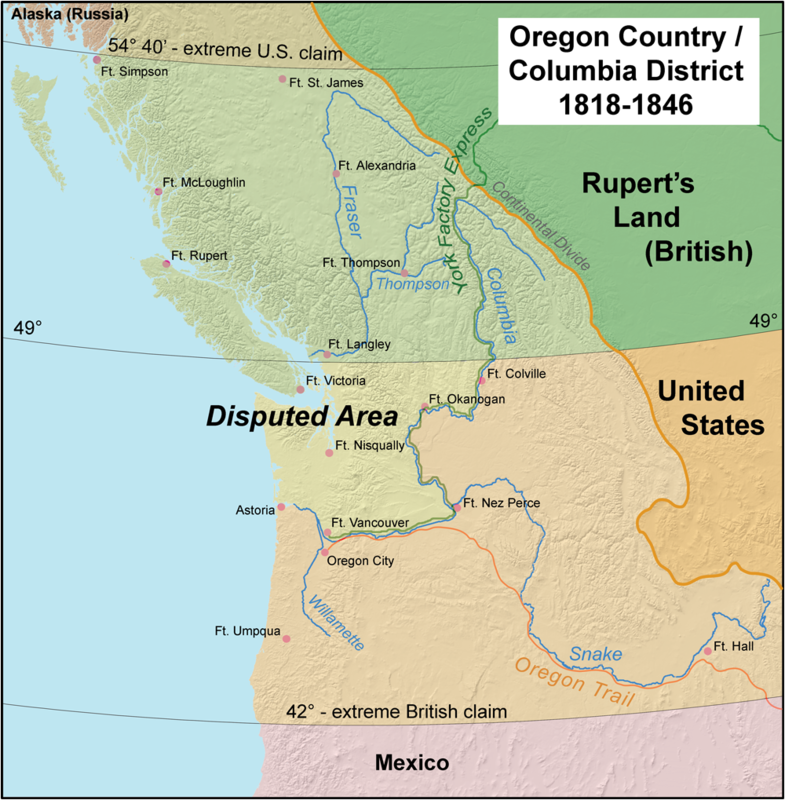 The region west of those mountains was known to the Americans as the Oregon Country and to the British as the Columbia Department or Columbia District of the Hudson's Bay Company. (Also included in the region was the southern portion of another fur district, New Caledonia.) The treaty provided for joint control of that land for ten years. Both countries could claim land and both were guaranteed free navigation throughout. File:Oregon Treaty - NARA - 299808.pdf Joint control steadily grew less tolerable for both sides. After a British minister rejected U.S. President James K. Polk's offer to settle the boundary at the 49th parallel north, Democratic expansionists called for the annexation of the entire region up to Parallel 54°40′ north, the southern limit of Russian America as established by parallel treaties between the Russian Empire and the United States (1824) and Britain (1825). However, after the outbreak of the Mexican–American War in April 1846 diverted U.S. attention and military resources, a compromise was reached in the ongoing negotiations in Washington, D.C., and the matter was settled by the Polk administration (to the dismay of its own party's hardliners) to avoid a two-war situation and a third war with the formidable military strength of Great Britain in less than 70 years. ↑ "Convention of Commerce between His Majesty and the United States of America.—Signed at London, 20th October 1818". Canado-American Treaties. Université de Montréal. 2000. Archived from the original on April 11, 2009. https://web.archive.org/web/20090411212640/http://www.lexum.umontreal.ca/ca_us/en/cus.1818.15.en.html. Retrieved 2006-03-27. ↑ Walker, Dale L. (1999). Bear Flag Rising: The Conquest of California, 1846. New York: Macmillan. ISBN 0312866852. ↑ "Treaty between Her Majesty and the United States of America, for the Settlement of the Oregon Boundary". Canado-American Treaties. Université de Montréal. 1999. Archived from the original on November 13, 2009. https://web.archive.org/web/20091113034143/http://www.lexum.umontreal.ca/ca_us/en/cus.1846.28.en.html. Retrieved 2007-01-12.